A £50,000 Velocity grant has prompted a £1million investment in pioneering new technologies, propelling a Bedford electronics firm to the forefront of its industry. Axis Electronics, based at Bedford Heights, has seen the state-of-the-art equipment revolutionise its production line, becoming one of only a handful of businesses in the country capable of producing complex products used in the oil and gas industry as well as components for motorsport and aerospace customers. The new equipment has helped create almost 20 new jobs for local people and has allowed the company to automate processes which otherwise would have had to be done by hand. Axis chairman Phil Inness said: “We deal with global companies, producing extremely complex products. Without this investment some of those customers may have had to look elsewhere but this has allowed us to grow and become one of the leading players in the UK. Axis applied for a grant as a result of a networking meeting which showcased the work of Velocity and Bedfordshire Chamber of Commerce. 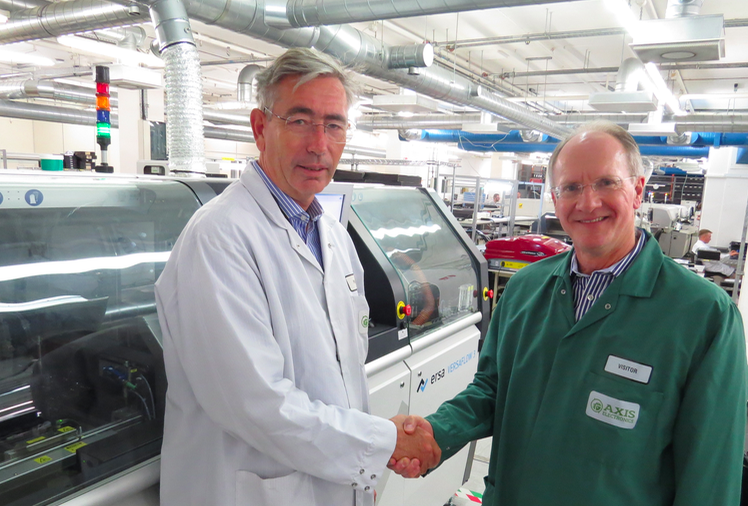 Following discussions with Justin Richardson, finance director of Bedfordshire Chamber of Commerce and Velocity business adviser Clive Haywood, Axis applied for £50,000 of funding to invest in specialist new soldering machinery. Within weeks, the grant had been approved and paid, allowing Axis to press ahead with its investment programme and order bespoke machinery imported directly from Germany.